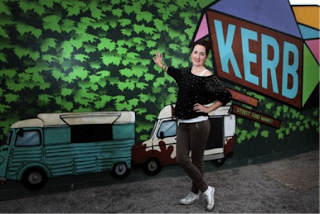 "Join the Queen of London street food, Petra Barran, for a crash course in how to make it in the cut-throat world of street trading. If you’ve ever dreamt of launching your own food stall at a market, or opening the hatch of a food van to a line of greedy customers at a festival, this essential masterclass will catapult you from daydream to reality. Petra will arm you with practical know-how and industry insights from her experience as owner and operator of the iconic Choc Star mobile chocolate van, as well as founder of KERB, the online and offline hub for the best street food traders in the UK. Be prepared to have a go at styling your stand, serving up grub and hear first-hand from Kitchenette’s first batch of entrepreneurs which includes The Good Egg, Mei Mei’s Street Cart and Kimchinary."